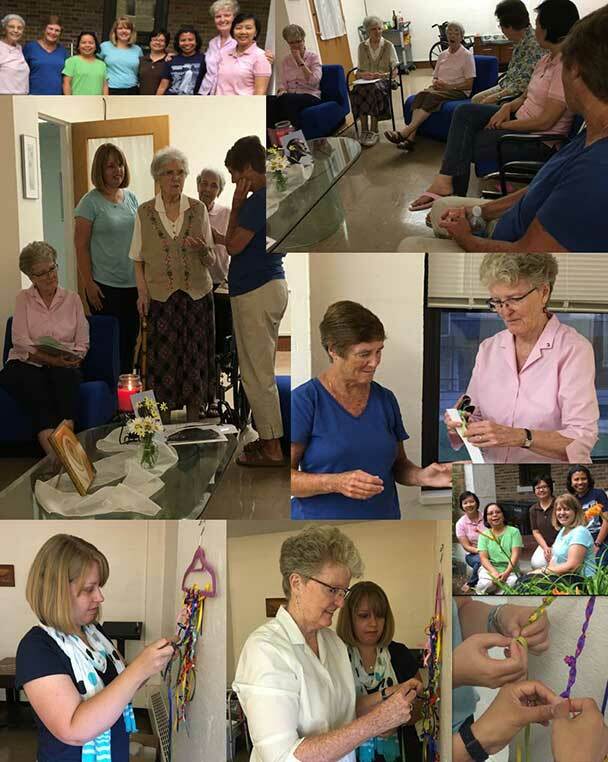 Maryknoll Sisters of St. Dominic, Inc. and Blauvelt Dominican Sisters gathered at Maryknoll, July 15-17, 2016. The primary purpose of the weekend was to provide opportunities for sisters in temporary profession to get to know one another. But the weekend also provided an important forum where significant sharing and collaboration between the two Dominican Congregations happened. The weekend’s plan took the shape of stories that are significant to the Dominican Family—the stories of Dominic and Catherine, Molly Rogers, M.M., Mary Ann Sammon, O.P., and Dominican stories of solidarity manifested in the Hispaniola homily, the story of Maryknoll’s Four Churchwomen. We shared and ritualized together about how these Dominican stories and traditions are weaving patterns into our lives today and making our shared charism visible in the world. The Story Weaving weekend concluded with Eucharist, a shared preaching, and a presentation to each participant of pieces of the weave we had woven together in the course of our story-weaving weekend.